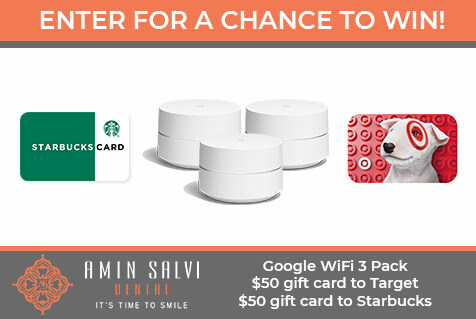 Win a 3 pack of Google WiFi, a $50 gift card to Target, or a $50 gift card to Starbucks. We have a new brand name, a new website, and are re-dedicating ourselves to giving you the best care you’ve come to expect from us. To celebrate our renewed vision we have put together a fun little website scavenger hunt. The rules are simple. The questions are listed below, all you have to do is retrieve the answers, which you can find all on the Amin Salvi Dental website. Submit your responses and you’ll be automatically entered to win. There will be three separate winners so don’t miss your chance to win some awesome prizes!